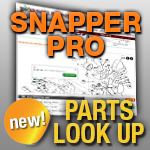 Snapper Pro Electric PTO Clutches: Jacks is your Place! We have the Electric PTO Clutches you need, with fast shipping and great prices! For lawn mower parts and accessories, think Jacks! Diameter Pulley 6 1/2 "